Written by two former admissions officers at top universities and current admissions coaches, this book is a must-have for preparing a winning college application. 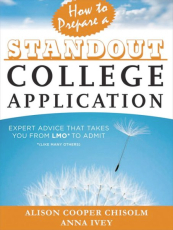 The authors reveal the mystery behind what college admissions officers are looking for and show applicants how to leverage their credentials, stand out in the over-crowded applicants' pool, and make a genuine, memorable impression. This is the book that will help the college-bound get off the "like many others" pile and onto the acceptance list. This book is filled with step-by-step advice that students and parents can use immediately and will refer to again and again.